Welcome to the village of Ivy Hill, where friendships thrive, romance blossoms, and mysteries await. . . . Thank you for visiting Ivy Hill. 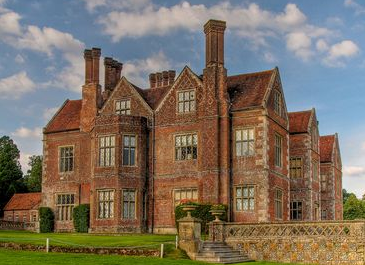 If you’re anything like me, you probably love village series set in England, whether in books or in television. Series like Larkrise to Candleford, Cranford, and Thrush Green. I think what draws us to these series are their close-knit communities filled with quirky characters. Or maybe it’s just the British accents. Whatever the reason, I hope you will enjoy my first series as well. For now, take a stroll though these pages, see the village map, photos, book previews, character list, and more. Stay as long as you like, and return again soon. I will have a room reserved for you at The Bell, a hot cup of tea waiting, and stories to tell. Come home to Ivy Hill, where friendship endures, romance triumphs, and mysteries are revealed in this eagerly anticipated conclusion. . . .
A gentlewoman in reduced circumstances, Miss Rachel Ashford lives as a guest in Ivy Cottage. With her meager funds rapidly depleting, she is determined to earn her own livelihood . . . somehow. Her friend Jane Bell and the other village women encourage her to open a circulating library with the many books she’s inherited from her father. As villagers donate additional books and Rachel begins sorting through the volumes, she discovers mysteries hidden among them. A man who once broke her heart helps her search for clues, but both find more than they bargained for. Rachel’s hostess, Mercy Grove, has given up thoughts of suitors and finds fulfillment in managing her girls school. So when several men take an interest in Ivy Cottage, she assumes pretty Miss Ashford is the cause. Exactly what—or whom—has captured each man’s attention? The truth may surprise them all. The Ladies of Ivy Cottage will be available in paperback, hardcover, e-book, and audio from your local bookstore or from online retailers. 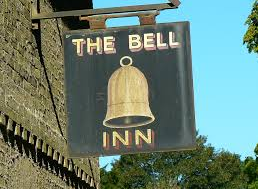 The lifeblood of Ivy Hill is its coaching inn, The Bell. When the innkeeper dies suddenly, his genteel wife, Jane Bell, becomes the reluctant owner—and learns that a large loan is due in three months’ time. Despite their strained relationship, Jane turns to her mother-in-law, Thora, for help. Thora has been struggling to find where she belongs. But as she and Jane work together, Thora’s wounded heart begins to heal. When she encounters two men from her past, she sees them—and her future—with different eyes. Can Jane save The Bell? And will Thora embrace the possibility of a second chance at love? The Innkeeper of Ivy Hill will be available in paperback, e-book, and audio from your local bookstore or from online retailers. 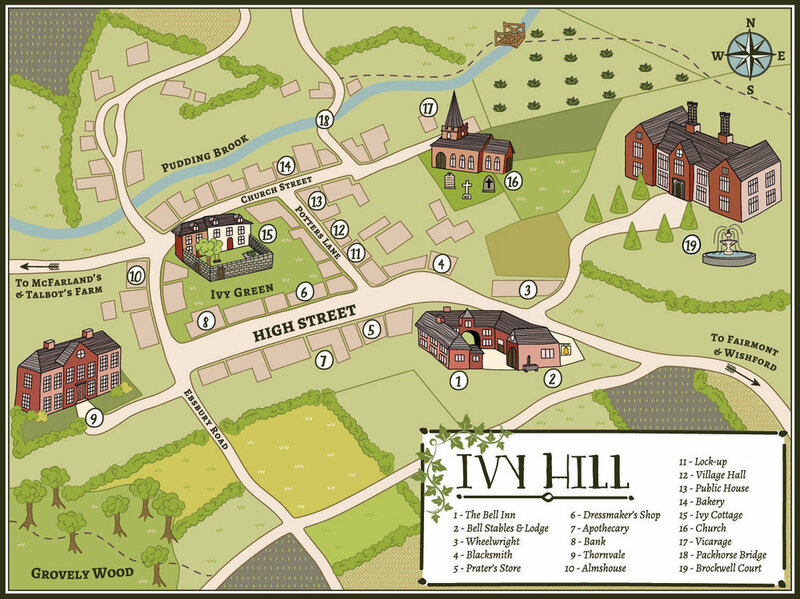 Ivy Hill is a fictional place, but there are many villages like it in England. I’ve based Ivy Hill’s layout on the National Trust village of Lacock in Wiltshire, which I’ve had the privilege of visiting a few times. 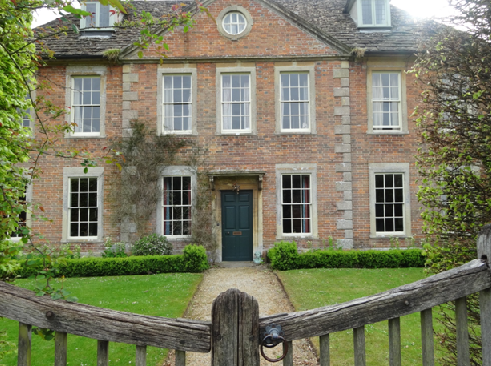 Lacock was used as a film location for scenes in Pride & Prejudice (1995), Cranford (2007), Emma (1996), and recently, a market scene in Downton Abbey (season 6). Even though I am using Lacock as a basic model for Ivy Hill, I’ve placed the village farther south, on the old Devonport-London Royal Mail route, not far from Salisbury and the real village of Great Wishford. Here are a few photos to help you imagine Ivy Hill. loves all things Jane—Jane Eyre and Jane Austen. A graduate of the University of Illinois, Julie worked in publishing for sixteen years and now writes full-time. Three of her books, The Silent Governess, The Girl in the Gatehouse, and The Maid of Fairbourne Hall, have won the Christy Award for Historical Romance. The Secret of Pembrooke Park was honored with the Minnesota Book Award for genre fiction. Julie has also won the Midwest Book Award and Christian Retailing’s BEST Award, and has been a finalist in the Romance Writers of America’s RITA Awards and ACFW’s Carol Awards. Julie and her husband have two sons and live in a suburb of St. Paul, Minnesota. For more information and a full list of her books, visit julieklassen.com or her author page on bethanyhouse.com. Sign up to receive early notice of new TALES FROM IVY HILL book releases, giveaways, and other fun series news. To learn more about Julie and her other books, visit julieklassen.com, or connect with her on Facebook, Twitter, or Pinterest.